(CNN) - It's not often you see would-be priests pelting each other with snowballs. But as the old saying goes, "When in Rome..."
Residents of the Italian capital woke up on Monday to find their city covered in snow, the unusually freezing conditions prompting some seminarians to launch a snowball fight in St. Peter's Square in Vatican City. Schools were closed and traffic brought to a standstill, with temperatures across the country plummeting to between minus 4 degrees Celsius (25 degrees Fahrenheit) and minus 8 degrees Celsius (17 degrees Fahrenheit), according to the UK Met Office. 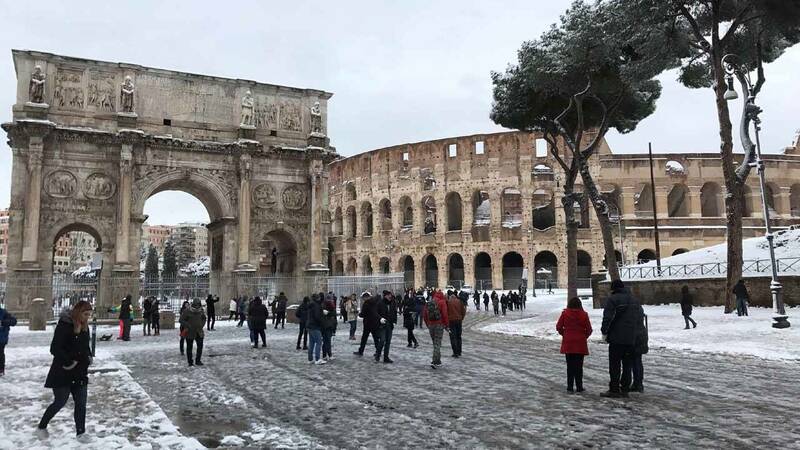 The average high in Rome for the month of February is 13 degrees Celsius (55.4 degrees Fahrenheit) and the average low is 3.5 degrees Celsius (38.3 degrees Fahrenheit). For March, the high is usually 15.2 degrees Celsius (59.3 degrees Fahrenheit) and the low is 5.2 degrees Celsius (41.3 degrees Fahrenheit), according to the World Meteorological Organization (WMO). The chilly weather, which has been dubbed "the beast from the east," is the result of cold winds from Siberia sweeping across Europe. "It is going to bring severe weather that lives up to its name," UK Met Office meteorologist Becky Mitchell told CNN. "We probably haven't seen it this cold or disruptive since March 2013." The big chill comes because of a "stratospheric warming" above the North Pole that happened around two weeks ago, explained Mitchell. This means that temperatures in the atmosphere (roughly 30,000 feet in the air) rose very quickly, in effect dragging cold air from Siberia across large swaths of Europe. The chill is set to travel as far south as Spain, where some northern areas including Barcelona are expecting snow, according to the State Meteorological Agency. Corsica, a French island in the Mediterranean, received about 10 centimeters of snow Monday, with temperatures plummeting to minus 2.3 degrees Celsius (28 degrees Fahrenheit), said the WMO. The cold snap is expected to continue this week, peaking around Thursday, said Mitchell. In the UK, temperatures are expected to hover around freezing by day, plummeting to as low as minus 15 degrees Celsius (5 degrees Fahrenheit) by night. Snow, combined with strong winds, means "parts of the UK will feel as cold as the Arctic Circle," said Mitchell.